In Frederick’s new Age of the Entrepreneur, “small business” defines the size of the workforce but not success. Before Sean O’Keefe graduated from law school in 2009, he was among millions of young people across the U.S. worried about their future. The nation was two years into a recession, and O’Keefe’s earlier plans to enter real estate law and join Frederick County’s development boom seemed, well, unrealistic. “There was almost no hiring” of lawyers nationally and in Frederick, he laments. Two years earlier, Timika and Gregory Thrasher of Frederick were just starting a family and working long hours at full-time jobs but insisting on keeping their home spotless and allergy free. Friends teased them that they could run their own cleaning business and make a fortune. Meanwhile, Middletown native Erik Boettcher was an Army corporal deployed overseas, constantly spinning potential inventions through his mind, hoping they might somehow lead him to a successful business startup. Since the beginning of the economic decline in 2007, lawmakers and economists have sought ways to encourage individuals like O’Keefe, the Thrashers and Boettcher to revive small business as the “backbone of America.” Once a thriving town of “tanning and canning,” Frederick itself has seen the success of independent, family-owned businesses ebb and flow with the nation’s fortunes over the centuries. Local business and real estate struggled following the Civil War, during the Great Depression and coinciding with the arrival of two shopping malls in the 1970s — with periods of rebound in between. In recent years, the recession and grim job market have led long-term professionals to consider independently marketing their skills locally, while younger generations view self-employment as a more secure foothold in the wake of the scandalous demise of the multibillion-dollar Enron Corporation, collapse of the banking and housing industries, and the federal bailout of AIG. “As people see corporations are not distributing their profits equitably, more and more will say we want to be in charge of our own destiny,” says Francesca Contento, president of the Alliance of Small Businesses, a membership organization focused on networking support for small businesses in the county. It’s hard to determine which way the trend is going locally for startups and how it compares to national studies that show an overall drop in the number of small businesses between 2008 and 2010. Beth Woodring, senior consultant with the Small Business and Technology Development Center in Frederick, says collecting exact numbers is difficult, but her analysis of U.S. Census data shows a 2.1 percent drop during that time period. “There is no way to determine how that shift occurred, however, so I would be reticent to say it indicates a particular trend,” she warns. The Frederick County Chamber of Commerce would like to say the trend is going the other way, as its members have increased from 760 to 1,050 since May 2010, with 84 percent of them representing small businesses. Many factors have converged to make the timing — and the place — right for enterprising individuals in this area. City and county planners have long promoted the Frederick area for its ideal location at the interchange of three major highways and the driving distance from Washington, D.C. and Baltimore. Decades ago, they sought to alter its “bedroom community” reputation, and in the past 20 to 30 years, an increasing number of people have opened shop (some have closed and were replaced by others) downtown. Ask longtime downtown business owners about the reason for their success, and they will point first to the Carroll Creek project that commenced after a 1976 flood washed through 100 acres of downtown and sent businesses fleeing. Early stages of the effort included burying power lines; executing a $65-million flood-control project (one that began in the 1980s); relocating the courthouse, city hall and the Weinberg Center for the Arts; paving areas along the creek and luring in unique restaurants and independent retailers. The project’s conception drew controversy due to its size, cost and — according to some opponents — the potential to destroy the beauty of the downtown area. But city officials plowed forward. “When you look at Frederick you are looking at a place where the overall health and quality of the downtown has improved dramatically over the last 30 years,” says Cindy Powell, who started Needles & Pins 20 years ago. Her shop’s establishment followed the investment of Bert Anderson, a native Texan who arrived in Frederick more than 40 years ago and subsequently developed Shab Row and Everedy Square on East Street. Local lawmakers also have invested in such growth industries as biotechnology and other advanced technologies. Government spending in the region makes contracting business possible and provides some insulation from the economic downturn (however, watch out for those looming federal budget cuts). With the expansion of Fort Detrick and its resident National Cancer Institute labs, as well as Frederick Community College, “a lot of trends are coming together,” says Ed Robinson, a New York native who is president of the Entrepreneur Council of Frederick County and founder of the management consulting business Capacity Building Solutions, Inc. Consider the population spike. The 2010 U.S. Census showed 233,385 residents in the county, an increase of 19.5 percent since 2000 (195,277 residents) and 55 percent since 1990 (150,208 residents). The state projects a population increase to 339,700 residents by 2030. Industry and government spending, improved schools and lower housing prices spurred this growth. In fact, many small business owners are relative newcomers to Frederick, with some originating from as far away as California and Texas. And they, alongside some native residents, are creating a hotbed of entrepreneurship that includes artisans, technical experts, inventors, communication specialists, service specialists, nonprofit enthusiast and various other professionals. Some welcome the change; other longtimers resent it. During the 19th century and in later decades, some residents frequently discouraged plans that might attract newcomers and disrupt their quiet neighborhoods. Several times, they even rejected the establishment of a rail line through downtown Frederick, but finally conceded. But what about O’Keefe, the Thrashers and Boettcher? O’Keefe found a way to blend in. Facing the grim job market in 2009, he set out on his own, walking the main street of his native Middletown until he found a suitable place he could afford to rent and hang a sign a quaint house with white siding and green shutters and trim where (perhaps by chance?) a real estate business also resided. O’Keefe Legal Services, LLC offers something he discerned was scarce in the region and presented potential for stability: wills, trust and estate planning. He got his first customer from his church before he had even set up his office. The Thrashers’ “green cleaning” company was just showing signs of success in 2009 — with two years under its belt. Timika and Gregory continued to maintain their full-time jobs at Potomac Edison and a local mortgage company while caring for their 15-month-old baby. However, the couple followed their friends’ advice that local businesses would hire office cleaners who use environmentally-friendly solutions. The two filled the garage of their Frederick home with supplies and diligently worked nights and weekends while relatives watched the baby and, later, two more children. Thrashers Cleaning Service now has 20 accounts and about a dozen staff members. Timika — who spent her early childhood in New York — sees the real and near possibility of focusing full time on the business. Boettcher, who now holds the rank of sergeant and lives in Urbana, hopes to find customers among th growing Frederick population — and ideally well beyond the county’s borders — for his invention, Neubrew, a tea cup that permits steeping with no mess, burns or spills. The father of three young boys (ages 5 and younger) is married to a Texan he met during his deployment in Germany; Boettcher is currently awaiting his full patent. In the interim, he has launched a “crowd funding” website with plans to unveil hi product locally this summer. He envisions turning a healthy profit by the time he retires from the service in three years. One of the biggest challenges to starting a new business is not just determining whether you can succeed but how. Despite the high-profile debates among federal and local lawmakers about new or potential incentives to make success more likely, there’s obviously no guarantee, but Frederick is full of entrepreneurs who have made their business dream a working reality. Beth Schillaci, president and founder of VillageWorks Communications Inc., learned the basics of Internet technology at a startup acquired by Netscape. After she and her husband made Frederick home 15 years ago, she launched a business out of their basement, initially building websites for businesses and expanding her services as technology advanced. She now brands herself as a social media-marketing specialist for small businesses and “solopreneurs.” Over time she has both expanded and contracted the size of her company. Powell’s niche business, focused on a craft that has waxed and waned with technological and demographical changes, faces her own challenges keeping clientele walking through her quilting store’s doors. “You have to be willing to make the commitment. It is 24-7. You never stop thinking about it. You never stop worrying about it,” she says. “If you’re willing to commit to trying to make it long term … you need partners who are willing to work with you.” And she says you have to be willing to put your own money back into the business. As a former full-time executive director of The Community Foundation of Frederick County, Powell also feels strongly about being engaged in the community. She runs community service projects such as a collections for Advocates for the Homeless families and donation of quilts to the police department to provide to babies and children. Although today’s technology helps you to escape the confines of the office cubicle and set up your own shop at home, sometimes that basement corner or small extra bedroom-turned-office can feel a little lonely or isolated, leaving you craving that water cooler conversation. And while the neighborhood coffeehouse may offer a stimulating atmosphere, not everyone who stops in for a mocha grande is there to focus on the daily grind. So where can you go for the flexibility and freedom of working in your own office while being able to interact with colleagues in a professional environment? A growing network of collaborative work spaces in Frederick County — and across the nation — provide the self-employed, the small business owner, the starving artist and the remote worker an avenue for networking, advice, low-expense office amenities or traditional professional veneer. Each of the owners of these entities knows their space fits the need of a specific type of worker or business, and they often refer potential clients to one another (so don’t feel slighted if you visit one and are redirected). Cowork Frederick opened in September 2012 in a refurbished old house downtown at 122 E. Patrick St. Its hardwood floors, front parlor room with fireplace, back kitchen with windows and patio lend a homey feel. Upstairs, you find a large, window-lit conference room equipped with modern conveniences like a projector and speakerphone. Down the hall are private phone rooms and individual offices. Yes, there are bathrooms where you can even shower after biking in to work. You can join for an hour or two to test it out, or you can come one to five days a month to meet with clients or hold classes. There are also part- or full-time options for those seeking a more regular office base. Membership allows you to use any room (with an agreement to clean your own dishes). The free-flowing use of space, the Fergusons and its founding members combine to provide a sense of community and permit a spontaneous exchange of ideas and expertise. The Business Factory of Frederick is located in a vacated factory building at 801 N. East St., Suite 6-A, near 8th Street in Frederick. It houses several offices near the front reception area; in the back, behind a wide open space with foundation floor and an unfinished, high ceiling, memories of the town’s industrial past echo in the space. This is where General Manager Peggy Richman, who opened the facility at the start of 2013, envisions artists’ workspaces and shows. Meeting rooms, classrooms, kitchen and a storage area are also present. Richman patterned the Business Factory in part on designs of collaborative workspaces at Affinity Lab in Washington, D.C. She aims for a local flavor with a heavy emphasis on nonprofits, artists and decorated spaces with locally refurbished items, such as a chicken feeding tray that serves as a business card holder. Richman offers a range of membership options, but she insists on collaboration and camaraderie among members. Potential clients not only interview her, but she interviews them and gauges whether they will fit into the mix and be willing to support nonprofit causes. “I want to know if you are willing to engage and be part of this community,” she explains. Kenneth and Lisa Engelke, who recently launched Strategic Ecosystems, provide on-site IT support. Thrashers Cleaning Solutions uses the space to store its cleaning supplies and conduct employee trainings, while also providing cleaning services for the Business Factory. Regus is a multinational corporation that created its own office space in Westview Village on Buckeystown Pike, just off I-270. It offers the modern feel of a professional corporation complete with receptionists, private offices for one to three workers, a shared conference room and kitchen. You don’t even have to clean your own coffee cup! Team leader Julie Bain Miller (who hails from Colorado) ensures that she and her assistants meet your every need. Want your phone calls answered in such a manner that clients think they are calling a large business, rather than a cell phone that rings in your living room with the echoes of the television or children fighting? No problem. “If you want a corporate image and have someone walk in and say, ‘Wow!’ — we fill that image,” Miller says. Regus operates five other locations in Maryland with sights on four more. Frederick was an ideal location, she states, because of Fort Detrick, government contractors and various other businesses in the county. Regus opened the Frederick location in September 2012, and within five months, its 42-office facility was half full. 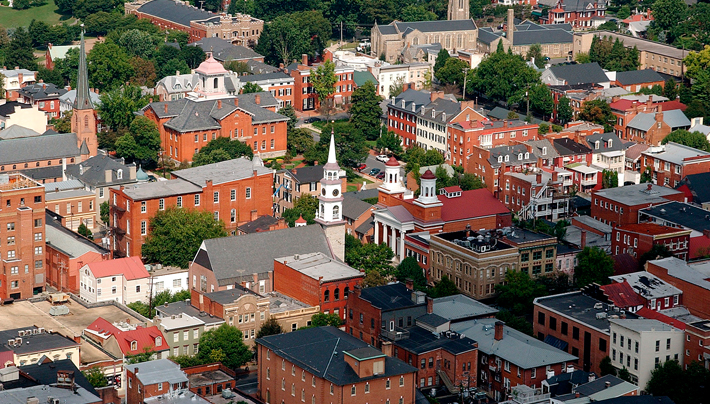 Whether you rent an office for three months or three years, you gain access to space not only in Frederick, but in any of the centers around the world. Or, the space can simply serve as your professional business address while you operate out of your home. Miller will even have business cards made for you. The Frederick Innovative Technology Center, Inc. at 401 Rosemont Ave. in Frederick, opened in 2004 as an incubator to help encourage and support innovators across the county. And, in other ways, businesses are becoming more intertwined with one another. Members of the groups listed above — as well as their hosts — also are members of, or work with, the Frederick County Chamber of Commerce, the Downtown Frederick Partnership, SCORE and the Entrepreneur Support Network (which itself offers leads to a variety of other networks and partnerships) and many other avenues for doing business. Don’t want, or can’t afford, to pay to join any of these? In 2011, Francesca Contento started the Alliance of Small Businesses, a place where approximately 30 members have started to learn about resources in the county and state, exchange ideas and frustrations, and study examples from business leaders in the area. Contento, a former employee a Freddie Mac who operates an independent student exchange service, hopes to find other ways to help them succeed. “I’m trying to focus on small business. Many are at-home folks who can’t afford a pricey membership to a partnership or make weekly commitments,” she says. Entrepreneurs in Frederick County include artisans, craftsmen, tradesmen, web gurus, nonprofit enterprisers and more. They chose unique paths for themselves for various reasons: the sluggish economy that cost them their jobs or threatened their entry into the workforce; the desire to end a taxing stop-and-go, I-270 commute that left them little time or energy for their family; the motivation to change direction after their kids secured financial independence; the decision to test one of the dozens of creative ideas racing through their minds daily; or the attraction to simply be a part of one of the county’s tight-knit communities. Each one is finding unique ways to grab a piece of the bustling activity downtown, at Fort Detrick or near one of the major employers in Frederick — all while making a connection with the county’s growing population. Auto mechanic Nick McKerrow, 25, of Thurmont became disillusioned with dishonest and unfriendly customer service by his former employers — auto repair shops and dealers. “I saw a lot of money coming in and I knew how much labor and parts cost …. I wanted a bigger piece of the pie … and I wanted to be far more honest to the customer,” he says. In 2010, he opened his own repair shop across the street from Fort Detrick. The used car dealership that set up shop in a former Jeep dealer building on the same lot as McKerrow’s business provided him with his first customers. Positive referrals gained him even more clients among the workers at the Army base. He initially was challenged by managing the workflow, but he feels he’s got it down now. her customers in the Frederick area, which also provides a scenic backdrop for her work. Chris and Danny Crummitt give virtual house tours for real estate sales agents. A former real estate agent, Chris, 48, says she saw an opportunity for her and her husband Danny to start a home-based business two years ago after their children left the nest. “I realized then there was really nothing holding me back but my fear,” she says. Chris says that she and Danny prefer to do business locally, and they are receiving referrals from realtors and agents more regularly as businesses are picking up along with the real estate market. What were their challenges? Affording high gas and health insurance prices were two. Seed of Life Nurseries, Inc.
Michael and Michele Dickson, ages 38 and 40 with three children, struggled financially to launch a nonprofit built upon their small nursery that provided flowers for companies and churches. Initially, they coordinated efforts to plant flowers in low-income areas, and then began growing one- to three-acre plots of produce to feed the hungry. A partnership with Community Supported Agriculture (CSA) four years ago helped them tap into financial assistance. ”Shareholders” pay into the program with a guarantee of a half bushel of produce every week for 28 weeks. Proceeds provide the Dicksons with seed money to feed low-income families in the community. They work with Title I schools, churches and the health department to locate families, who in turn are invited to work in the field (80 to 85 percent do) to learn growing, harvesting and responsibility. “It breaks down the social status,” Michael explains. Last year, Seed of Life — employing the Dicksons and one part-time worker who combined efforts with more than 200 volunteers (from the community and the state correctional facility in Hagerstown) — had 60 shareholders and helped more than 100 families. Tinshop Arts Collective Gregory Baughman and Andrew Burdette opened Tinshop less than a year ago. The pair named it after the tin shed located in a friend’s backyard where, in their youth, they created T-shirts for benefits and friends’ bands. After high school, Baughman toured with bands before returning to his original art interests. The 32-year-old now has his first child and a home set in an old stone manor on a 180-acre farm in Clearspring. There, he and Burdette, along with his fiancée Cristiana Lupulescu and 17-year-old brother Alex, began making jewelry from repurposed aluminum, tin, wire and other objects, in addition to abstract paintings and T-shirt designs. “We are a collective supporting each other,” Baughman says. Baughman and Burdette also intend to help budding young artists realize their own potential; at the Business Factory of Frederick, the two plan to provide after-school care for kids 10 to 18, teaching them jewelry making, art and music. They’ll also continue to sell final products both to pay the kids and to help finance the program.